These are some of the most highly anticipated plastic models to be released in 2010. After a few shipping delays, and then packaging delays they're finally among us. 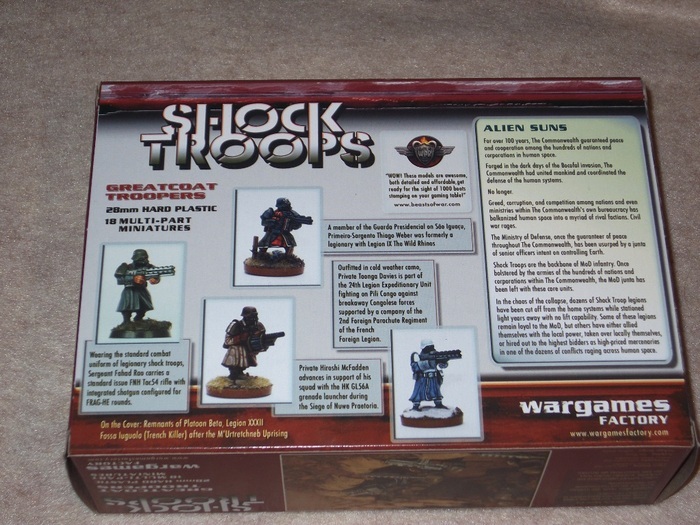 The Wargames Factory Greatcoat Troopers eventually were renamed the Shock Troopers on the packaging, but elsewhere they're still called the Greatcoat Troopers on the very same packaging. So what to call them is a little confusing at first. I'll just refer to them as the Shock Troopers throughout this article. What separates most of the Wargames Factory stuff from the majority of the competition, is that they use 3D CAD software to create the models, instead of using a traditional physical model sculptor. They also have in place what they call the Liberty and Union League, which is a program where if a person suggests an idea for a sprue, and if 1,000 people promise to pre-order that sprue, then they'll put that sprue into production, and it can become the next project from Wargames Factory. The person who submitted the idea is rewarded with 10x of those sprues, and is given a $100 gift certificate for Wagames Factory products too. Wargames Factory is also based here in the US, right outside of Boston, Massachusetts. 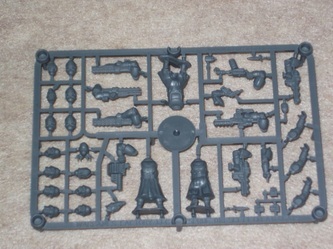 Upon opening the box you'll find six plastic sprues worth of models. 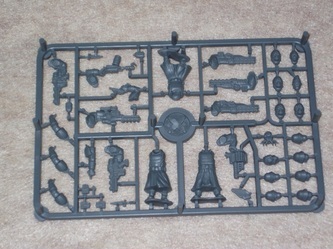 Each sprue is identical, and you can make 3 models from each sprue. 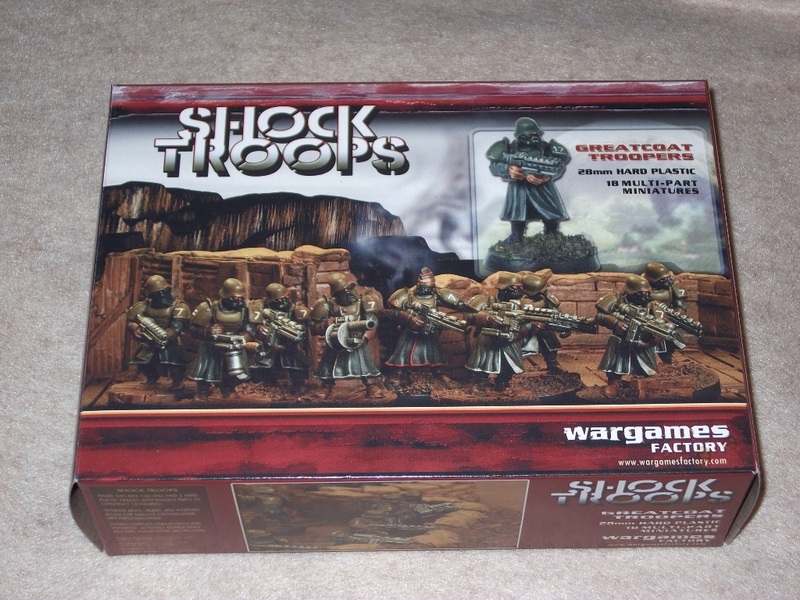 Therefore this is an 18 model boxed set of Shock Troopers. I also counted 38 pieces per sprue total. 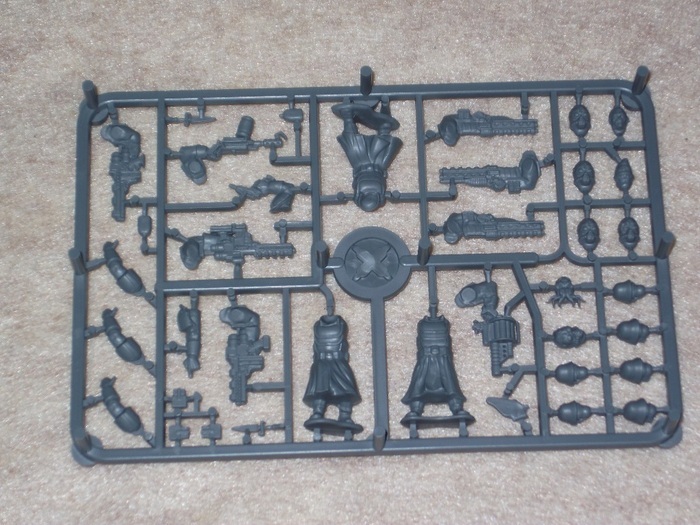 On each sprue you are given 3x different bodies to build upon. One is standing straight up and down, the other walking slowly forward on the right leg, and the last one is walking forward on the left leg, slightly bent forward. Here's where it gets interesting. While you're limited to pretty much a single choice for the left arm (aside from 1x arm outstretched pointing per sprue) which is very much like the standard Space Marine arm cupped to hold the underside of a weapon. The right arm options are, however, quite robust. There's 3x of the standard assault rifles, which are anything but standard, actually they're quite impressive. The assault rifles resemble a combination of a pump shotgun underneath with an assault rifle on top. 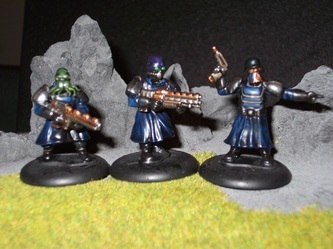 There's also a flamer, what looks like a grenade launcher, and 3x other unique weapons, which could no doubt be stand-ins for plasma, lasers and melta-guns in Warhammer 40k. There's also a single right arm holding a pistol per sprue, plus 2x daggers, a holster with pistol in it, and some ammo clips and two canteens, all of which you can glue onto the belt region of the body to adorn the greatcoats. When it comes to head options, I've never seen so many choices ever before. There's literally 14x heads on each sprue! 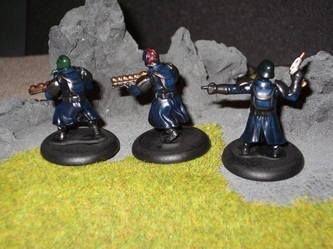 There's 3x of the standard German helmeted and gas-masked Greatcoat types, which are the ones you've probably seen everywhere in advertisements for this set, plus 3x of another type of head with a German-looking helmet, but with a different almost robotic face. Actually they look like a cross between old school Cylons and Darth Vader, only with a German helmet. Cool stuff indeed. There's also 4x alien heads with goggles and brains sticking out the back of the top portion of the heads, a single zoidberg-looking head with tentacles hanging from the face, and a single head resembling the other 4x alien heads, only slightly different. There's also a single commander-looking type head, and lastly a long haired head, with a pony tail on top, with some cybernetic implants. With some tiny rare earth magnets, I can't see why you couldn't do some modding on these, so that you could use them in sci-fi games, and weird WWII games both with a little imagination. All it would take is modifying the heads and neck area on the bodies to accept tiny rare earth magnets, and then you could swap in and out what head you want to use on any given day. These clean up quite easy, as I don't think these are any different than a boxed set of GW plastic models. Sure you'll find some profile mold lines here and there, but next to no flash. The pieces also fit together rather well for the most part, but the heads fit a little funny, unless you do some cutting and filing in the neck region on the main body pieces beforehand. Aside from the head issue, these are no different than building GW plastic Space Marines, because even the way the weapon is held is very similar, as you have to juggle gluing the left and right arms on at the same time so that the left arm cups the underside of the weapon just right. I also found it easier to test fit the arms, and then tack the left arm on to prime them, but remove it so you can reach the chest region when it comes time to paint the models. The level of detail is sufficient considering the price, but don't expect GW or Privateer Press level of sculpting detail from these models, because there's just not that much going on here. These are essentially long trench-coat wearing guys with some armor pads in the front and back, wearing gloves, holding a weapon. They are, what they are. Thankfully what's there is defined very well, but don't go overboard with the primer, or you might just obscure some of the detail too if you're not careful. 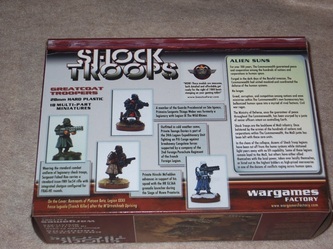 This boxed set is probably one of the absolute best values out there at present, because I've seen this Shock Troopers boxed set of 18 models selling for no more than $20 most places. 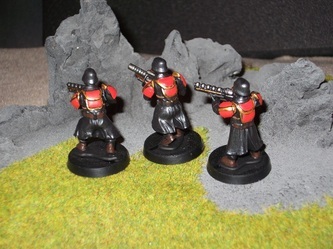 My only gripe would be that there are no plastic bases included with the models. So you'll need to supply your own bases. They do come with their own little built on integral bases, but I really hate those, and I really don't see the point of useless integral bases in this day and age. More so considering most models that come with integral bases don't even work as a base, because they're too small to be of any use to help models stand at all on their own. I think I'll eventually hack the integral bases off of my models, and re-base them without soon. If you glue them onto a 25mm or even a 30mm round base, without hacking the integral bases off, you end up with models much taller than the average 28mm model. Even with no bases included, the number of options and build possibilities with these models make this one of the most versatile sets around. You could easily use these in Warhammer 40k, Faction Wars, Fear and Faith, even AE Bounty. 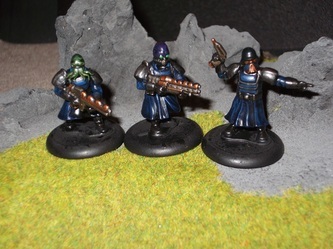 These would be great for any of the alternate reality weird WWII games using 28mm scale models as well. If you're a Bitz collector, there's a bounty of left over goodies to be had here too, with a bunch of heads and weapons, all of which look to fit most 40k models nicely. The sculpts are also nice, but you're getting what you pay for, so don't expect GW Blood Angels-quality plastic models for $20. I do however like the fact you could go full on sci-fi aliens with these via the options provided, or roll with the traditional sci-fi greatcoats look. Giving customers options is always a good thing. I'm especially impressed with the weapons too, the sculpts are quite original, and before seeing these, I had thought that by now all of the original ideas for sci-fi weapon sculpts had been taken. I'm glad Wargames Factory proved me wrong there. You really can't go wrong with a box or two of these, because price-wise they can't be beat. The possibilities for using them are endless too. 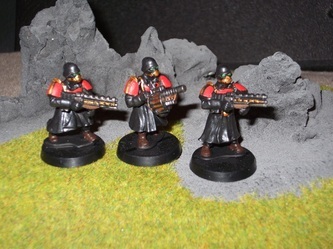 Imperial Guard players who don't care about being tournament legal can create some impressive Death Korps forces with these models. I've seen a few other conversions, where the owner used GW arms/shoulder pads and weapons on these, and they looked even more impressive than what you can put together right out of the box. So using GW bits on these is definitely an option too. The sci-fi/weird WWII skirmish gamer should also find a number of uses for these models. 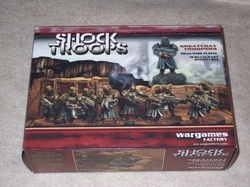 Best of all at about $1.11 per model what's not to like about the Wargames Factory Shock Troops? The deal gets even better if you wanted 3x boxes or more, as they're still running deals on their website for bulk deals on these models too.